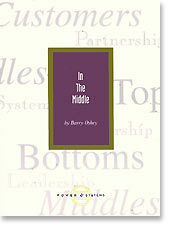 Home > In The Middle > In The Middle by Barry Oshry - Paperback. An updated edition of Oshry's pioneering work on Middles. Oshry illuminates life in "middle" positions in organizations -- positions in which supervisors, middle managers, coaches, deans, department heads and others must function between the often conflicting perspectives and demands of those above and below them. IN THE MIDDLE clarifies the stresses of middle positions, the disempowering pitfalls to be avoided, the strategies for empowerment, and the unique contributions empowered middles can make to the organization. I have used text with more than 5,000 managers I have worked with over the past 30 years. Invaluable. Some of the most practical insights about the world of Middles in print.